Kookaburra selected Do-It Corporation’s R-54 Fold-Up Hang Tab to provide display flexibility for their extensive line of napkin products. When the hang tab is folded down, retailers have the option of displaying the product on a shelf or in a bin. When the R-54 is folded up, the napkins can be hung on a peg hook or display strip. The R-54 is folded down during shipment, allowing Kookaburra to utilize their original master carton box. 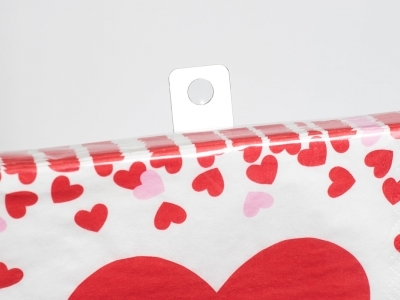 In addition, the clear hang tab does not block any product information on the package. Kookaburra also selected the Norpak 1000 ALT Hang Tab Applicator System, available from Do-It Corporation, to automatically apply the R-54 hang tab. The Norpak 1000 Hang Tab Applicator is designed for high-speed, precise, automatic hang tab application.